Mark your calendar! 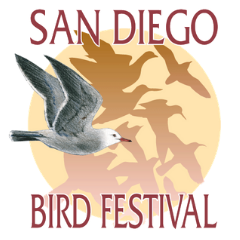 Come and join the 23rd Annual San Diego Bird Festival on February 27 – March 3, 2019 at Marina Village Conference Center San Diego. Enjoy and hope to meet you at the Festival! The San Diego Audubon Society invites you to the San Diego Bird Festival, which celebrates the birds and habitats of San Diego county. Welcome to the San Diego Bird Festival! We’re celebrating the birds and habitats of our county, which truly offer some of the best birding in the United States. In a world where social media and smart devices seem to be taking over, birds are a lovely reminder that the world is full of real experiences. All you need to do is Look Up!